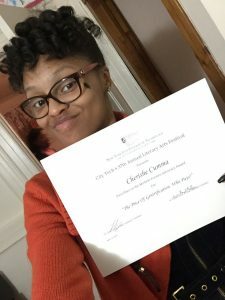 On April 12th, 2018 I received an email from Professor Lucas Kwong informing me that I won First Place in the Michele Forsten Advocacy Category for my paper “The Price of Gentrification: Who Pays?” I was ecstatic when I read the news that my paper had been chosen, and that I was going to receive an award. Immediately I called my loved ones and my mentors to tell them about this major accomplishment in my life. Honestly, I didn’t know what to do with myself because this paper “The Price Of Gentrification: Who Pays?” caused a lot of controversy in my life. What I mean by this is that I had a lot of people tell me that discussing this topic was going to cause too much uproar. People also told me that my words were too harsh, and that I should try and soften my words so the message I was trying to convey wouldn’t offend people. For weeks I faced backlash from various people who were not only against my views, but who also were against me speaking out on this topic. However, I didn’t let these people stop me from saying what I had to say, and because I spoke my truth I was awarded an honor for a paper that I wrote while being nearly on the brink of tears. This paper was a work of art that came from the depths of my soul. As I typed the words, I allowed myself to express my pain in the only way I knew how, with hopes that people who were and still are experiencing the same thing as me, could gain some comfort. I understood that I could potentially offend many people, and possibly make some people uncomfortable, but it was a risk I was willing to take. So I went up against many people, and in the end it was all worth it when I walked on to the stage in the Atrium Amphitheatre and accepted my award in front of people like my Mother , Father Professor Jospeh Jeyaraj, Professor Jason Ellis, and The Buzz’s own Professor Jill Belli. In that moment I felt as though my hard work paid off, and I was grateful for those people who supported me through the process of writing about the current struggle I was going through with seeing how the neighborhood I once knew had drastically changed.In the end I realized that in life you will face many obstacles when it comes to speaking about topics that may cause the majority to cringe. However, the best part about writing this piece on gentrification was not only the award, but the positive feedback I received from people who said they were going through the same thing. After reading my piece many people shared with me how difficult the process of gentrification has been for them, and many of them were glad to hear my side of the story. Winning this award at The Literary Arts Festival was a blessing for me because it showed me that my words resonated deeply with other people. People heard and they understood me and to me that was valuable recognition. Now that I have told you about the struggle I faced to tell my story, and how my struggle turned into triumph, tell me your story. Have you ever experienced a struggle that was difficult to overcome, but in the end everything worked out in your favor? If so, let me know in the comment box below.